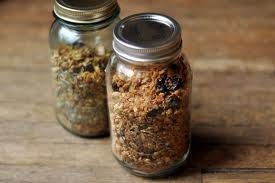 This Granola is a staple in our Kitchen. We use it for everything from yogurt to ice cream topper, and everything in-between It is especially great treat for Vegans, and people who cannot have gluten. But don’t let that scare you. I have converted many a die-hard junk cereal fans to my way of enjoying something healthy that does not taste healthy. 1.Preheat oven to 250 degrees F.
2.In a large bowl, combine the oats, nuts (or seeds),apples,cereals,coconut,and brown sugar. 3.In saucepan, honey, oil, vanilla and salt. Heat over a medium flame until very hot. 4.Combine both mixtures and pour onto 2 sheet pans (jelly roll). Cook for 1 hour and 15 minutes, stirring every 20-30 minutes to achieve an even color. 5.Remove from oven and transfer into a large bowl. Add dried fruit and mix until evenly distributed.